This year one of my resolutions is to read more books. I try to squeeze in some reading time in between our other activities. On my list are many classics, new bestsellers, historical fiction, marriage books, and some parenting books. One of my books for the month of January is Motivate Your Child. It’s a wonderful and practical parenting resource written from a Christian perspective. I’m loving all the insights that I’m gleaning from this book. I’m on a launch team to help promote the release of this book. Our team is hosting a giveaway! To celebrate the release of Motivate Your Child: A Christian Parent’s Guide to Raising Kids Who Do What They Need to Do Without Being Told, members of the Launch Team are sharing a wonderful giveaway filled with a Go Pro Camera, $50 Mardel Gift Card, $25 Amazon Gift Card, and book bundles from both the National Center for Biblical Parenting and Thomas Nelson Publishing! Three winners will win prizes with a total value of nearly $800! HERO3+ Silver captures gorgeous, professional-quality 1080p60 video and 10MP photos at speeds of up to 10 frames per second. Built-in Wi-Fi enables you to use the GoPro App to control the camera remotely, preview shots and share your favorites on Facebook, Twitter and more. Compatible with all GoPro mounts, you can wear it or attach it to your gear for immersive POV footage of your favorite activities. It’s waterproof to 131’ (40m) and built tough for all of life’s adventures. Combined with stunning low-light performance, high-performance audio and an ultra wide-angle glass lens, HERO3+ Silver makes capturing and sharing your life easier than ever. 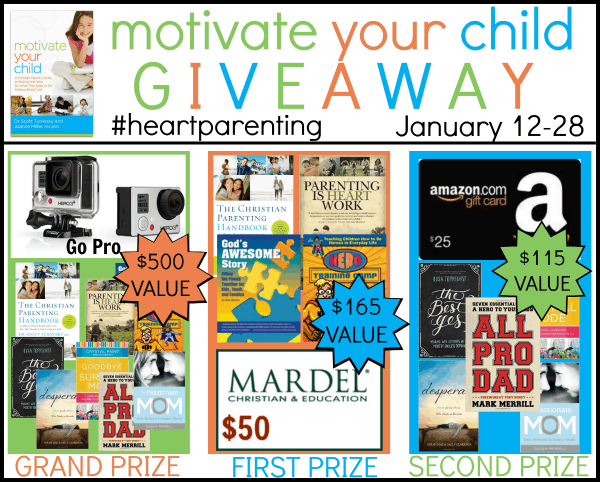 The Best Yes by Lysa TerKeurst Desperate by Sarah Mae and Sally Clarkson Say Goodbye to Survival Mode by Crystal Paine All Pro Dad by Mark Merrill The Passionate Mom by Susan Merrill To enter, use the Rafflecopter below. Giveaway dates: January 12, 2015 @12:00am ET through January 28, 2015 @ 11:59pm ET Terms and Conditions: This giveaway is open to U.S. residents only. Void where prohibited by law. Must be at least 18 years of age. This giveaway is in no away associated with Twitter, Facebook, Instagram, Pinterest, or Amazon. No purchase necessary for entry. Odds are determined by the number of entries. Selected winner will have 48 hours to respond to email notification to claim their prize or another winner will be drawn.